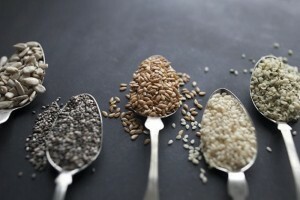 Nutrient-dense seeds are finally starting to get the attention that they deserve. Packed with healthy fats, protein, fiber and lots of minerals and vitamins, the following seven super seeds are an ideal addition to your meals to ensure you’re eating a balanced diet. Because of their soft seed coat, you will benefit from chia seeds’ nutrient content without having to grind them down. Sprinkle them on salads, mixed fruit, yogurt, and oatmeal. Soaking them in water or juice for about 10 to 15 minutes results in a gelatinous liquid. Consuming chia seeds in this manner will help your body digest them. If you want this extra benefit, add them to smoothies, make a delicious chia seed pudding, or create a thicker gel and use as an egg or oil replacement in baked goods recipes. An ounce of flax seeds contains nearly 8 grams of fiber and 12 grams of fatty acids, as well as about one-quarter of daily recommended requirement of magnesium for increased energy. Some research has shown that consuming flax seeds as part of a healthy diet can lower high blood pressure and cholesterol levels. Ideally, you want to purchase your flax seeds whole and grind small amounts to store in the fridge for a week’s worth of use. Pre-ground flax seeds have been exposed to oxygen longer, which causes breaks down the polyunsaturated fats, thus lowering levels of omega-3 fatty acids and conjugated linoleic acid that benefits the heart. Because of this, even whole flax seeds are better when stored in a fridge or freezer. You probably know them best from picking out the slimy insides of pumpkin each Halloween. These flat slimy seeds dry out into a tasty snack whether you roast them or toast them. If you prefer a salty snack, boil them in salty water before you dry them. Smaller to medium size pumpkin seeds can be eaten with their shells when properly toasted, although the larger seeds are probably best to eat shelled. You can also grind them up into a meal to add to baked goods recipes. Pumpkin seeds are a great way to add protein, iron, zinc and especially magnesium to your diet. Magnesium helps stabilize blood pressure, assists in bone strength and even reduce stress. Men can benefit greatly from the phytosterols chemicals found in pumpkin seeds, which have been shown to alleviate symptoms associated with having an enlarged prostate. Sesame seeds are a common addition to many Asian recipes and stir-fries. They are so small, you typically won’t be eating them as a snack, but they are an essential ingredient to keep in your kitchen because they are incredibly rich in calcium, magnesium, iron, and zinc. You can pretty much add them to any stir fry, inside or outside of sushi rolls, or sprinkle them toasted on a salad. A common Middle Eastern paste, tahini, is made from sesame seeds and is used to make hummus, baba ghanoush, and halva. Tahini, when mixed with soy sauce, also makes a nice dip for spring rolls or can be spread on flatbread similarly to peanut butter. Once shelled, sunflower seeds are very versatile. They can be eaten raw or toasted, put on salads, in bread, in trail mixes…you can even use them to make raw vegan cheese. Another one of my favorites is sunflower-seed butter, a great butter replacement if you’re going dairy-free or vegan. I won’t deny it. Papaya seeds are definitely not on the most-delicious list, but they are definitely packed with nutritious goodness. Offering a strong, peppery flavor, papaya seeds are often discarded because most people find them difficult to eat. I agree – who wants a mouthful of peppercorns?!? But once you learn about the health benefits of this flavorful seed, you could easily become accustomed to the taste, especially since a spoonful in a morning smoothie often goes unnoticed. You can also dry them and grind them up to use instead of pepper in salad dressings and on other foods. Papaya seeds are rich in oleic and palmitic fatty acids, which are believed to ward off cancer. In Latin American countries they are used to help protect the body from insect-borne diseases, such as dengue, while in traditional Chinese medicine, they are used to detoxify the liver.